We have a new pattern video tutorial demonstrating our Toilet Tissue Cover pattern. 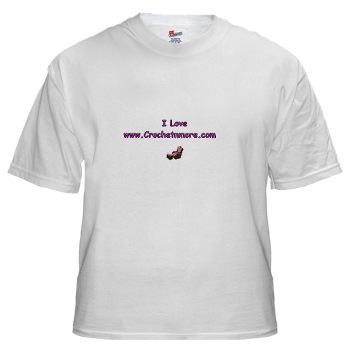 Visit the pattern page and crochet along with me. 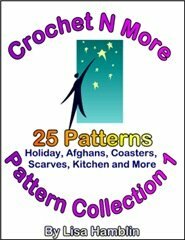 has 131 videos (so far) to help you crochet. 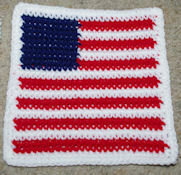 We're still working on our online crochet course ... keep watching our homepage for information about how to sign up. when you click the link... it comes up to a page that is referred... just wait for it. But I say to you that everyone who is angry with his brother shall be guilty before the court; and whoever shall say to his brother, "Raca," shall be guilty before the supreme court; and whoever shall say, "you fool," shall be guilty enough to go into the fiery hell. If therefore you are presenting your offering at the altar, and there remember that your brother has something against you, leave your offering there before the altar and go your way; first be reconciled to your brother, and then come and present your offering. But we request of you, brethren, that you appreciate those who diligently labor among you, and have charge over you in the Lord and give you instruction, and that you esteem them very highly in love because of their work. Live in peace with one another. And we urge you, brethren, admonish the unruly, encourage the fainthearted, help the weak, be patient with all men. See that no one repays another with evil for evil, but always seek after that which is good for one another and for all men. Rejoice always; pray without ceasing; in everything give thanks; for this is God's will for you in Christ Jesus. LAST WORD IS TO APOLOGIZE." Little children, guard yourselves from _______. making the required stitches around the first & last single crochet stitches on each row. 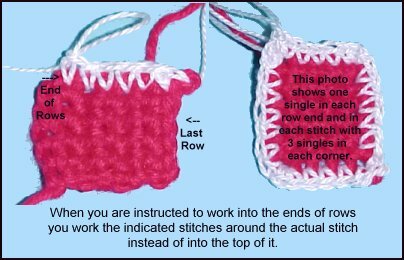 If the first & last stitches on the row are double crochet stitches you work around the post of the double crochet stitches. No matter what kind of stitch you are using you work around the actual stitch on the end of the row... not into the top of it. 3 singles so the motif wouldn't curl up. This is a great use for scrap yarn. Hi. I really enjoy your newsletter & decided today to take advantage of asking you a question or two. 1. I crochet tightly and to compensate I increase my hook size by sometimes 2 sizes. I have consciously tried to loosen my stitch but when working on something larger than a washcloth, I general go back to my tight ways. Any suggestions? 2. I have worked on several projects that require a SC be made all the way around the item. My last one said to place 115 evenly spaced SC on the edges. This always throws me because I don't exactly know how to "evenly space" SC when there aren't other SC to put these in to. The rows are not repetitive so the ends are not consistent. Is there magic to making this work or to counting???? Since changing your hook size hasn’t helped with your tension problem... try holding your hook differently. If you normally hold your hook like a knife, change to a pencil hold. If you normally hold your hook like a pencil, change to the knife hold. Think of it this way... The area of the project that requires the stitches must first be divided into sections. Then it’s time for a little math. You need to know how many stitches you need to add per section. Lets say the length of the project is 23 inches and you need to place those 115 stitches evenly across that area. Use stitch markers to mark your project in one inch increments and place 5 stitches within each one inch section. Thanks for all the work you do on your website, and the free patterns. I really like this pattern, but how do you handle switching between colors and weaving in the ends. Your finished product looks so neat and clean. The Row Count patterns on my site eliminate the need for a graph but are worked similarly in regard to changing colors. The videos on the above page show a demonstration of the Purple Heart Coaster pattern. You can watch how I changed colors as I make the coaster. The coaster patterns are great first “row count” patterns. Hdc is a half double crochet. Yarn over again and draw through all three of the loops on the hook. I am looking for a pattern from about 30 years ago! It was a mouse bookmark and as I remember it was a chain with several dc in each chain so it curled around and then had a chain long tail and little eyes. Any help would be appreciated. I want to make 125 of these for first graders I have been working with on their reading. I know they were very easy to make, but can't find my pattern. that says it can be used as a bookmark. Would you happen to have a picture of one of the bookmarks you had? Crochet Tip: Most of the time graphs for Crochet and Cross Stitch patterns can be used interchangeably. Graphs for crochet and cross stitch are normally charted on true square grid paper. Knit graphs are not... since knit stitches are shorter than they are wide the knit graphs are charted on "knitter's graph paper". With each square on knitter's graph paper not being a perfect square the image will be distorted if used with crochet or cross stitch. I didn't know knitters graph paper was different! Thanks for the heads up! It can be used as a coaster also. Wanted to say thank you for your preemie hat pattern that I've used. This is the link to my Mama Jo's Inspired by Love page of preemie hats (so far) and the credit I've given to your wonderful work. Thank you! I'm glad you enjoyed the pattern... the hats are adorable! I'm working on the white toilet tissue cover pattern...and just don't think I'm reading the pattern correctly... I come out with a flower but it doesn't quite look like the picture shown. I get up to rnd 5 but don't understand where the 9sc are suppose to go. did yellow w/E and green w/I hook. I'm in the process of making a video tutorial for this pattern. The 9sc go into the chain 6 loops on Rnd 3. You should have 6 ch3 spaces when you finish Rnd 2 and 6 ch6 spaces when you finish Rnd 3.
thanks for the quick response, I was trying to get them done for mother's day. I look forward to the video tutorial, because even though my flowers look good, I don't know if I was doing it right, and it would be nice to see how it is done. thanks again. make these for my perinatal hospice. Can I make them bigger and smaller? You’re very welcome... this pattern should be easy to adjust. adjust the number of stitches that are joined to form the shoulders also. I can I have this crochet bookmark pattern please I want to do it to okay that﻿ look great okay . Thanks You? The link to the﻿ pattern is below the video. What﻿ yarn are you using? 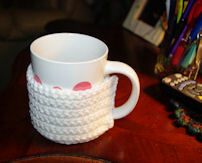 For the video I used﻿ a worsted weight yarn and larger hook so you could see how I made the bookmark. The pattern uses bedspread weight cotton thread with a #7 steel hook. This is listed in the materials section on the pattern page. I was wondering if you cut and tie each time you change colors? Could you let me know please? No, I carry the unused color along as I crochet. Put the yarn (in a basket) on a turn table to easily untwist it. That's a really good idea. I like to use my yarn in the order it is in, so if blue is first I place it in front of the white, then when I use white I place it behind the blue. Always in the same order, and I turn so the yarn doesn't wrap up. I figured this out the last few times I had to untangle everything. Scrap Yarn Idea: Scrap cotton yarn = randomly striped dishcloths. Crochet until you use one color then switch. I've never thought of that till now. ‎Katherine Harris: 2 chains in the corners will work fine also.... see if that helps. 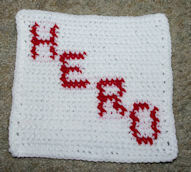 thanks it has helped I was using pound of love I hook going to use different yarn like this pattern. 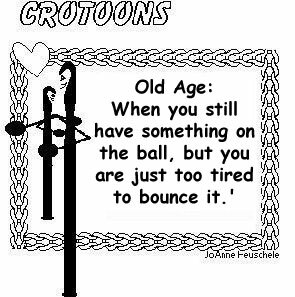 On your crochet table you talk about crocheting into the hump do you mean crochet in the back loop of the chain ? Yes, into the back loop ridge of each chain. I recommend hand sewing a lining because you can stitch only on the inside of the work. If you sew in a lining using a machine the thread will distort your stitches and be visible on the outside of your bag. What kinds of patterns do you suggest to someone just learning to read them? (I'm self taught and can't understand them. Patterns marked “easy” that use only a few stitches. 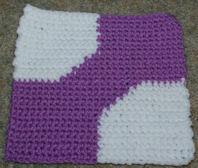 Believe it or not… a full size afghan using one stitch is a great way to practice. 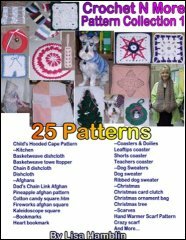 Do you have a certain pattern you want to make? Use yarn bobbins to store small scraps of yarn. useless junk in the garage. Do we buy hotdogs in packages of ten and the buns in packages of twelve. Do we order a cheeseburger and large fries with a diet soda. A man walked into a gift shop that sold religious items. "WWJD" printed on all of them. couldn't figure it out, so he asked the clerk. do in the same situation. sure Jesus wouldn't pay $17.95 for one of these caps." breakfast on July 2, 1961?" again. He greeted him by saying, "How." since the library is large and has a confusing layout. phone to call for help. they located my position from the card catalogue. we ran into his friend at the library. "Who's he?" the friend asked Alex, pointing to me. A strong young man at the construction site was bragging that he could outdo anyone in a feat of strength. He made a special case of making fun of Morris, one of the older workmen. After several minutes, Morris had enough. "Why don't you put your money where your mouth is?" he said. "I will bet a week's wages that I can haul something in a wheelbarrow over to that outbuilding that you won't be able to wheel back." "You're on, old man," the braggart replied. "It's a bet! Let's see what you got." Morris reached out and grabbed the wheelbarrow by the handles. Then, nodding to the young man, he said, "All right. Get in." brother-in-law's -- but he said I could use it." A worried, anxious traveler was boarding the airplane when he asked the stewardess “Do these planes crash often?”. The stewardess responded, “Only once!”. a large box in the middle of the living room floor. shampoo, powders, tooth paste, and paper items. her husband Mike, asked smiling. "I'm writing to General Motors!" the entire time in the mall chasing after him. to take you?!" I scolded. While sports fishing off the Florida coast, a tourist capsized his boat. him clinging to the overturned craft. the tourist shouted, "Are there any gators around here?"